We’ve been Dublin-heavy this week as the start of the college football season nears, but Navy won’t be the only service academy to open its season Saturday — just the only one to do it on national television in a foreign country. Far from the spotlight but far more likely to come out victorious, Air Force will kick off against Football Championship Subdivision (the artists formerly known as Division I-AA; another name change pending) foe Idaho State. Here’s a quick breakdown. When and where: Saturday, noon Mountain time (2 p.m. Eastern), Falcon Stadium. TV: None, but the the game will be streamed live online here. Really? No TV? : Yes, but the school announced regional TV deals for the other four games on its schedule that didn’t have TV homes. As always, your full academy football TV schedule is here, updated throughout the year. When Air Force has the ball: Connor Dietz will follow two four-year starters (Tim Jefferson and Shaun Carney) behind center, making his first start since subbing for an injured Jefferson in 2009. He’s seen spot duty since then, piling up 678 yards on the ground and 392 yards in the air. His rushing prowess will contribute to a ground attack featuring converted fullback Wes Cobb, a senior who figures to get the bulk of the carries despite sharing time with senior Cody Getz and sophomore Jon Lee. The Falcons return no wideouts with more than five catches last season; junior Ty MacArthur had four, including two touchdowns. When Idaho State has the ball: The Bengals had 309 yards rushing last season. Total. All year. One-point-two yards a carry. Really. 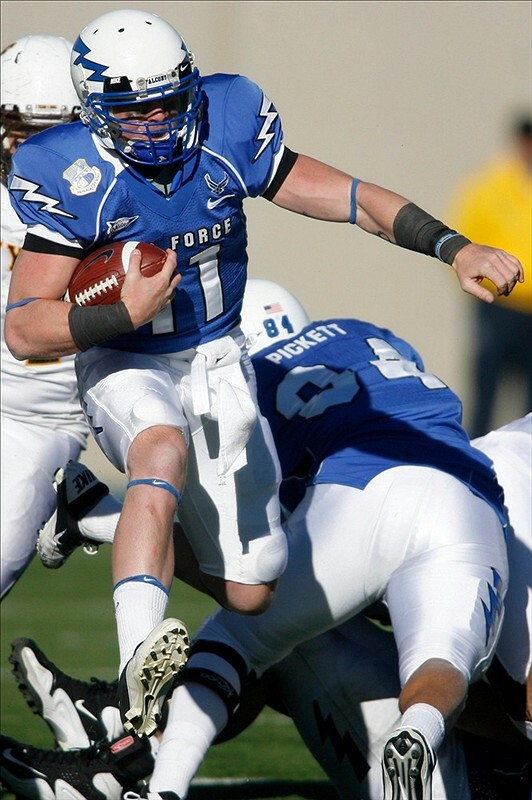 Air Force had 319 yards or better in eight different games in 2011. Idaho State returns all-name-team candidate Rodrick Rumble, who set a school and Big Sky Conference season record with 112 catches last year. Stopping Rumble falls to cornerbacks Chris Miller and Steffon Batts, who combined for just three pass break-ups (all from Miller) and 37 tackles last season. However, senior linebacker Alex Means (team-best six sacks in 2011) could help stop the Bengals’ air attack before it starts. About the Bengals: Idaho State went 2-9 last season. The Bengals are 0-16 against Football Bowl Subdivision opponents since beating Utah in 2000, according to this Idaho State release.